** WE HAVE A SECOND COTTAGE AVAILABLE. CHECK OUT VRBO.COM #1093843. SAME LAYOUT, WITH A 4TH BATHROOM & LARGER DECK. Looking for peace and serenity without looking over at the rooftops of the neighbours? 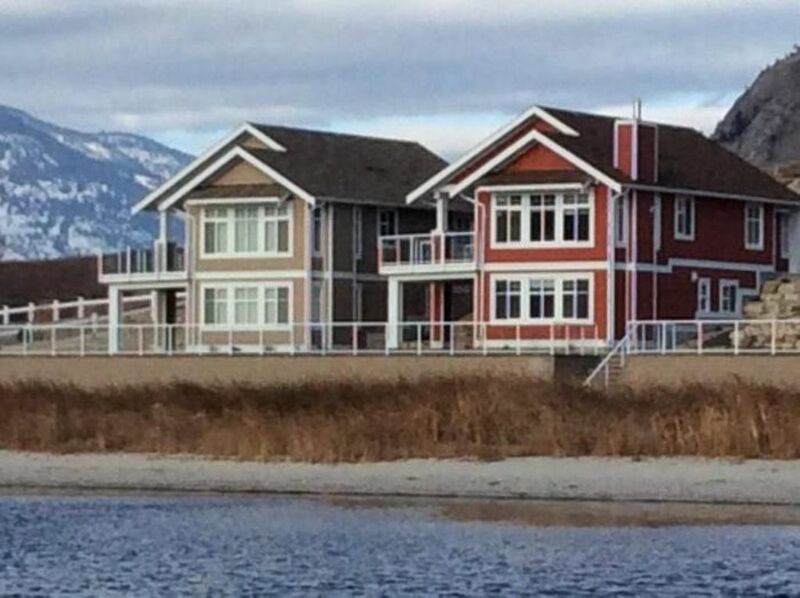 This gorgeous lake front home is located at the north end of Osoyoos Lake. The quiet area of the lake is a family friendly paradise for water sports and swimming! Of course, we are only minute’s away from Burrowing Owl and Black Hills Winery Estates if you like wine tasting! If you are looking for excitement, then consider how close we are to the new Area 27 luxury race track located in Oliver with 227 acres for motorsport enthusiasts! Area 27 Karting Centre has a world class facility guaranteed to get the adrenaline flowing. Check out: http://www.area27.ca/ for more details. In the summer, the local fruit stands and farmer's markets provide an opportunity to discover a wide variety of products including cherries, plums, peaches, apricots and nectarines. In the winter we are just 40 minutes from Mount Baldy Ski Area, and 1 ½ hours from Big White Ski Resort for all those riders that love powder snow! Oh, and we have a wood burning fire place to keep it nice and cozy. Our two-level 2400 sq. ft. home is spacious enough to accommodate two families with room to spare. The spacious lay out gives water views from the living room, dining room, kitchen and three of its four bedrooms. With beautiful views of the mountains and lake, you can walk out onto an upper deck and lower patio to catch the rays of sun, or enjoy the stars at night. A few steps down from the property takes you along a meandering path towards the dock, or to the 500 foot white sand beach, where you can enjoy an evening beach bonfire, play volleyball, or just watch the kids play in the sand. A clubhouse is shared amongst residents and visitors to this gated community, and includes 2 seasonal outdoor pools, 2 hot tubs, fitness centre and shared common room. Upper Level: Great room, kitchen, dining area, deck, 2 bedrooms, 2 baths and laundry room. •	Huge master suite with 1 King bed, private 4 piece en suite, with spacious glass shower, separate bathtub, and double vanity. Lake view and TV in room. A view of the lake will brighten any morning. Open concept great room with unobstructed views of the lake, double french doors leading out to a large partial covered deck. •	Partial covered deck with BBQ and patio set that seats 6 if you need shade. Lower Level: Entertainment area, 2 bedrooms, 1 bath. •	Guest room with 1 Queen bed with view of the lake. 5. Double french doors lead you to the ground level covered patio with Adirondack style chairs for 5 with unobstructed views of the lake and a hammock for afternoon naps in the shade. 6. SIRIUSXM Radio receiver allows you to access and listen to your SIRIUSXM account music downstairs. Bring your cable/adaptor if using your phone for your SIRIUSXM listening pleasure. The internet connection is a service dedicated to the property (wireless). Max occupants 12. Linens are provided. Please bring your own beach towels and toiletries. No young groups please. 7 night minimum stay. My husband and I moved to BC from Ontario in 1996. Although we left our families behind, we were very excited to start a new life in beautiful BC. We are graduates from York U, and Western & McGill with teaching and business degrees. We drove across Canada with my pet turtle, and settled in Vancouver. Since that adventure started, we are now a family of 5 with a cat, living in Vancouver. Our family is constantly taking advantage of the great outdoors with skiing, boating, hiking and continue to discover what this province has to offer. We always encourage our out of town relatives to visit, and sure enough, when they do, they too fall in love with beautiful BC! During two week car journey from Ontario (1996), we drove through the Okanagan and fell in love with the landscape, and met enough kind people that left a great impression on us. We knew that one day we would buy here! This property is particularly important to us, as it symbolizes how important it is to stay connected with our families back home. We bought this property, so that when our family visits, we can stay together in one place and create memories. Our kids enjoy everything that The Cottages has to offer, and the surrounding area. We are so happy to be here, and want to share this wonderful location with our renters. It truly is a beautiful place to visit. We like to take advantage of its amazing location on Canada's warmest lake and near BC's best wineries. Its a great place for family retreats and unwinding. The drive up towards Osoyoos is a reminder of how beautiful this gem of a place is. You'll pass the spiritual Spotted Lake, the abundant fruit stands in Keremeos, and the huge Adirondack chairs will lead you to our cute 2400 sq/ft cottage on the lake. We put care into the design and feel of our cottage. We didn't want it to show like a designer house from the city, for goodness sake, that is what we are all trying to get away from. Instead, we used personal items, to add spirit and generate feelings of comfort and relaxation. We've mixed old with new furnishings and decor, and the layout of our specific floor plan works for 2 families to share. We've kept in mind that when our families visit from Ontario at the same time, there has to be a place for all. We have plenty of room in the basement area for a large group of kids to have a sleep over on the couches or floor (if they don't want to use their bunks upstairs). The lower large screen TV is protected from the glare of the sun, so an afternoon movie will do for all while relaxing on the large sectional. The 8'x4' pool table is sturdy solid wood with room around, on those days you feel like staying in or challenging each other all night. Upstairs is bright and airy with a fully stocked kitchen, with plenty of room to take in the views. The million dollar view will keep you gazing out the windows each moment, and you can see our boat slip and the wild horses grazing. Once you walk in through the front door, you will instantly feel comforted at the thought that the layout and furnishings are kid friendly (you don't want to stress about that), the appliances are new and the laundry machines are ready (just in case). Listen to music on the BOSE, go for a walk, visit the clubhouse or head into town. Leave the city life behind....relax, unwind and refresh your body and mind under the warmth of the sun! You will enjoy many of these magical moments with your family, and it all starts with you booking our cottage. A small hair dryer provided in each bathroom. There are 2 magnifying mirrors kept in the master en-suite and lower bathroom. Plenty of drawers for everyone to hide their toiletries. our cottage is located 15 minutes away from both towns of Osoyoos and Oliver. Rattlesnake Canyon is a family friendly themed park, that offers mini golf, go cart racing, rides, and concession stand. In some cases, extra linens are kept in each bedroom closet. Located by the front hall area adjacent to the garage. Small load cycle works best. Cleaning supplies are kept in the upper cabinets. Large garbage and recycling bins can be used by guests. All garbage and recycling must be removed and taken after your stay. Guests not allowed use of owners personal items without permission. Wi fi. The code will be provided before your arrival date. SIRIUSXM Radio receiver available for your account hook up using: Ipod/Iphone/Android. Towels for use inside home only - no beach towels provided. Do not use towels to clean up messes. At the clubhouse. Guests will be given the code to enter the clubhouse. Kids under the age of 12 are not permitted in the exercise room. Rules are set by the Board of Directors on this development. Great room on upper level and entertainment area on lower level. Lower level area with 8'x4' pool table, games tables, large sectional with big screen TV and bean bag chair for fun! stainless steel. The regular wash cycle takes roughly 2.5 hours. The "eco" cycle takes more than 2 hours. Stainless steel. Second smaller fridge kept in the garage. Some condiments are stored there and available to use. Please remove expired condiments and keep the garage fridge clean. microwave splatter covers are kept in the kitchen island cupboards. Bagel and thick bread toaster usually kept in the pantry or under the counter. spices, coffee, tea and sugar. enough for 12 place setting. Steak knives may be kept in a different cabinet. They should be hand washed to prevent spots. large dining area can seat 8 comfortably and 10 in a squeeze. Additonal 4 can be seated on bar stools at kitchen island. Outdoor dining on upper deck can seat 6. BOSE sound system and SIRIUSXM Radio receiver available for Ipod/Iphone/Android hook up. Bring your adaptor/cable if you have a newer version (Iphone). This is not a blue-tooth system. DVD players are kept in the lower King bedroom, and in the TV room downstairs. A small round table can seat 4+ for playing board games or cards. Board games & cards are kept inside the large red cabinet. Please remember to put them back in place, as the little pieces might get kicked under the furniture , vacuumed up and forgotten. Please remove DVD's from the DVD player and return back into original case. We have 41 DVD's to share, and there is a laminated list left by the rec room TV. Enjoy! 5 Adirondack chairs and a hammock. Please prevent flipping the hammock, as it will cause damage. 2 seasonal outdoor heated pools at clubhouse. All guests required to shower before entering the pool. No pool toys (floating mats, water pistol) allowed. No glass permitted on the pool deck. Boat slip rental available for additional $25 per day. Preference is to rent from Saturday to Saturday (7 nights) during summer months. During the shoulder and off season, we rent our property for a 5 night minimum, however, please contact us for details. The house was well situated on the compound. We could be in there with children and grandchildren. Loved the 4 bedrooms. Loved the family room downstairs, where the little ones could watch some movies. A boat slip was nice. Loved the pool. I thought the kiddy pool was great, water was only 1 meter high, which meant the little ones could safely play in there. Loved the hot tubs. One negative there is no boat trailer storage. So we put our boat trailer in the garage. There is lots of visitor's parking, so everybody could have a parking space. Walking over the compound is very nice, there are walking paths and all the roads are paved. Very quiet location. We all had a great time. Lazy days at the cottage with friends. The place was nicely furnished and large. It was nice waking up to the sun shining and the view of the lake. The kitchen was well stocked with appliances, and bbq on the deck. Our group enjoyed using the pool and clubhouse fitness room. This weekend we visited the Area 27 race course and plan on coming back with friends. I would rate this cottage a high 10! This is our second time renting this lovely waterfront cottage. The place presents itself as a clean well kept cottage. The view of the lake is breathtaking , if you are in the upper area , on the deck, from the kitchen, living, or dining area.The lower level area is great for fun and games. Indoor or outdoor, the pool table lends itself great for the young ones. Outdoor is fantastic with the hammock and comfortable Adirondack chairs for relaxing. If you are star gazers you will see the stars as you have never experienced before. The white sand beach and the warm water was most enjoyable. The rooms are spacious clean with comfortable beds. The decor is tastefully done and presents the cottage as a beautiful , cherished family home and not an investment property. We enjoyed the pool & hot tubs at the community centre. Everyday I used the gym's treadmill. The weather is hot so bring your suntan lotion, your beach towels your favourite foods and leave the rest to your imagination for fun, games or relaxation. The nearby wineries are great not just for wine tasting but offers fantastic dining. We look forward for our next stay, when we take leave from our suburban home in Scarborough Ontario to enjoy family time and the beautiful mountain view of the Okanagan region and all that it has to offer. This was our third year staying in this gorgeous lakefront cottage. The room configuration works perfectly for our two families both upstairs and downstairs with media room for the two teenagers and bunk beds for the two 8 year olds. We love to watch the wild horses drink from the lake every morning and evening, the birds and ducks doing their thing, and this year we watched the beavers swim past and all from the comfort of our patio. The lovely touches of wood stacked in the garage if you desire a beach fire, the scooters for the kids to drive themselves to the pool, or the hammock that swings in the covered patio, add small but wonderful opportunities to create experiences in this well kept secret in the much quieter northern end of the lake. We never want to leave! Other than a small drive for dinner at Burrowing Owl Winery! Great pool with misters, and almost always uncrowded, otherwise the lake is right in front of this property. Boat slip available, what is there not to love in this resort. We are glad that you are creating memories in Osoyoos with your family at our cottage. Happy to hear that you took advantage of the hammock and scooters, and we look forward to hosting you again! What a great place to spend some time with the family. The house was amazing, you could really tell this was a family’s treasured vacation home and not just an investment property. Everything you could have reasonably expected was provided, everything was clean and the beds were very comfortable. The complex was nicely landscaped and very clean. There was a lot to do outside with the family and close to excellent wineries if not with the kids. The owners were excellent to deal with and very helpful with questions and logistics. We will definitely keep this home in mind if we return to the area. This gorgeous lake front home is located at the north shore of Osoyoos Lake. The quiet area of the lake is a family friendly paradise for water sports and swimming! Of course, we are only a short drive from world class wineries including Burrowing Owl Estates Winery and Black Hills Estate Winery. In the summer, the local fruit stands and farmer's markets provide an opportunity to discover a wide variety of products including cherries, plums, peaches, apricots and nectarines. In the winter we are just 50 km from Mount Baldy Ski Area and 180 km from Big White Ski Resort - great for all those riders that love powder snow! A few steps down from the property takes you along a meandering path towards the dock, or to the 500 foot white sand beach, where you can enjoy an evening beach bonfire, play volleyball, or just watch the kids play in the sand. A clubhouse is shared amongst residents and vistors to this gated community, and includes 2 outdoor pools, 2 hot tub, fitness centre and shared common room. Cancellation Policy: Full refund if we are able to fill the dates. There will be a $75 administration fee deducted. Be sure before you book. Rates are based on 12 person maximum occupancy. No young groups (under 25 years of age) can book our property. No tents permitted. Respect the quiet hours of 10pm-7am. We do not make any exceptions for pets.